One of the great joys (and benefits) of reading a text closely and often is that doing so allows you to notice words, patterns, characterizations, etc., you might otherwise pass by, and, even more importantly, see connections among them. Recently I have been working on a series of posts which examine how Gollum is portrayed in The Lord of the Rings before he physically enters the stage at the beginning of Book Four. In my first post I discussed at length what impression the reader can form of him from the references in A Long-Expected Party. Yesterday, while working on the second post, I made one of those connections, which I'll treat briefly here because it is tangential to the portrayal of Gollum, though still of interest. I had been reading through the first few pages of The Shadow of the Past when suddenly the following words struck me differently that they had previously done. Gandalf is the speaker. But since I had spent so much time looking at the passage in A Long-Expected Party for its links to Gollum, links which reveal other less savory aspects of what the Ring was doing to Bilbo, other words leaped off the page at me when I came to the passage in The Shadow of the Past. Specifically 'restless and uneasy' because I had just seen the first word a few pages earlier, in a description of clearly uneasy Frodo. As time went on, people began to notice that Frodo also showed signs of good 'preservation’: outwardly he retained the appearance of a robust and energetic hobbit just out of his tweens. ‘Some folk have all the luck,’ they said; but it was not until Frodo approached the usually more sober age of fifty that they began to think it queer. So it went on, until his forties were running out, and his fiftieth birthday was drawing near: fifty was a number that he felt was somehow significant (or ominous); it was at any rate at that age that adventure had suddenly befallen Bilbo. Frodo began to feel restless, and the old paths seemed too well-trodden. He looked at maps, and wondered what lay beyond their edges: maps made in the Shire showed mostly white spaces beyond its borders. He took to wandering further afield and more often by himself; and Merry and his other friends watched him anxiously. Often he was seen walking and talking with the strange wayfarers that began at this time to appear in the Shire. The connections Bilbo and Frodo here are many and obvious. Both are well preserved (by the Ring of course); both think of going to see mountains (1.i.32); both wander the Shire and talk to 'queer' folk; and Frodo is fast approaching the age at which adventure 'befell' (befell, like a misfortune, a very hobbitish word to choose here). Both are also restless and uneasy. Let's add another, that restlessness and uneasiness are a sign that 'the ring [is] getting control.' So here is one more sign of the Ring's influence over Frodo before he's ever started on his journey, to be put beside his state of 'preservation,' his reluctance to hand the Ring to Gandalf even momentarily (1.ii.49), and his inability to throw it into the hearth even when he thinks its necessary to destroy it (1.ii.60-61). Bilbo almost stopped breathing, and went stiff himself. He was desperate. He must get away, out of this horrible darkness, while he had any strength left. He must fight. He must stab the foul thing, put out its eyes, kill it. It meant to kill him. No, not a fair fight. He was invisible now. Gollum had no sword. Gollum had not actually threatened to kill him, or tried to yet. And he was miserable, alone, lost. A sudden understanding, a pity mixed with horror, welled up in Bilbo’s heart: a glimpse of endless unmarked days without light or hope of betterment, hard stone, cold fish, sneaking and whispering. All these thoughts passed in a flash of a second. He trembled. And then quite suddenly in another flash, as if lifted by a new hope and resolve, he leaped. Tragedy is an imitation not just of a complete action, but of events that evoke pity and fear. These effects occur above all when things come about unexpectedly but at the same time consequentially.1 This will produce greater astonishment than if they come about spontaneously or by chance -- for even chance events are more astonishing when they seem to have happened for a purpose. Reversal is a change of direction in the course of events....For instance, in Oedipus a messenger comes to bring Oedipus good news and rid him of his fears about his mother, but by revealing his true identity he produces the opposite effect.... Discovery, as the term implies, is a change from ignorance to knowledge, and thus to either love or hate, on the part of those destined for either good or bad fortune. Discovery takes its finest form when it coincides with reversal, as in Oedipus.... Reversal and discovery together will evoke either pity or fear -- just the kind of actions of which, according to our basic principle, tragedy offers an imitation -- and will serve to bring about the happy or unhappy ending. While I imagine the Inklings probably enjoyed a laugh over The Hobbit passage, Tolkien, though obviously quite clever, was never about cleverness for cleverness' sake. And this moment is one of the most important turning points in the entire Tale of Middle-earth, when the pity of Bilbo rules the fate of many. So clearly the echoes of Aristotle were not merely some donnish joke to be relished over a pint at the Bird and Baby. What's going on? Tolkien is not of course writing Tragedy. Faërie has a Poetics of its own, and Tolkien wrote the book on the subject. So we should not imagine that Tolkien is in any way following Aristotle. Yet the points of contact here -- fear/horror, pity, sudden understanding/discovery -- are too salient to be overlooked or dismissed. Even Aristotle's remark that 'chance events are more astonishing when they seem to have happened for a purpose' itself becomes astonishing when seen in the light of Gandalf's statement in The Fellowship that 'Bilbo was meant to have the Ring, and not by its maker' (FR 1.ii.56). But what is most remarkable is the reversal which we find in Tolkien. As in Oedipus reversal follows hard upon discovery, but in Sophocles Tragedy is revealed. In The Hobbit Tragedy is averted by Bilbo's discovery, by his 'sudden understanding' of Gollum, which evokes both pity and fear. As I have mentioned elsewhere, this is also precisely the moment when Bilbo first sees Gollum as a person, a 'he,' and not a thing, an 'it.' For an instant Bilbo is in a sense both tragic audience and tragic protagonist at once, and his discovery reverses his course from murder to mercy and from despair to hope. And, as if to underline the point that Tolkien is not writing Tragedy, it is Bilbo's sense of justice -- which Aristotle says the ideal tragic protagonist should not excel in2 -- that buys him the time to see Gollum as deserving of pity and mercy. Bilbo of course would be ill suited to be the protagonist of the kind of Tragedy Aristotle describes. The House of Bungo, mercifully, had little in common with the Houses of Atreus or Laius. And to my knowledge no tragic protagonist was ever likened to a grocer, not even by his most implacable foe. But Aristotle's thinking on plot and character, on recognition and reversal, has been seen to have some applicability to other genres before now.3 So it is hardly surprising that, with Pity and Fear so much and so importantly in play, the poetics of Faërie and Tragedy brushed up against each other here. 1 'Consequentially' might be a bit compressed for ready understanding. A more literal rendering of the Greek text (ὅταν γένηται παρὰ τὴν δόξαν δι᾽ ἄλληλα) would be: 'when one thing happens on account of another contrary to expectation.' That is, a causal link is reveal that had not previously been suspected. Aristotle, Poetics, transl. Anthony Kenny (Oxford 2013) 29. 3 Dorothy L. Sayers, for one, delivered a lecture 'Aristotle on Detective Fiction,' at Oxford in 1935, which Professor Kenny has included in his edition (79-88). Down the face of a precipice, sheer and almost smooth it seemed in the pale moonlight, a small black shape was moving with its thin limbs splayed out. Maybe its soft clinging hands and toes were finding crevices and holds that no hobbit could have ever seen or used, but it looked as if it was just creeping down on sticky pads, like some large prowling thing of insect-kind. And it was coming down head first, as if it was smelling its way. Now and again it lifted its head slowly, turning it right back on its long skinny neck, and the hobbits caught a glimpse of two pale gleaming lights, its eyes that blinked at the moon for a moment and then were quickly lidded again. 'Do you think he can see us?' said Sam. Only here, while he is inside the head of a desperate, frightened Bilbo who is contemplating murder, does the narrator refer to Gollum as it. It's as if Bilbo, whom the narrator has explicitly said 'could not find much pity [for Gollum] in his heart' (92-93), is trying to keep Gollum's humanity at sword's length here. He fails. And the transition from it to he marks that failure: 'And he was miserable, alone, lost.' Every prior he in this paragraph refers to Bilbo. The sentence could equally well describe him at this moment. And that instant of indeterminacy allows pity to come flooding in. The paragraph and the history of Middle-earth both pivot on this shift of pronoun. Bilbo is of course the (original) narrator here, just as Frodo is in the passage from The Lord of the Rings above. Frodo has also previously felt no pity for Gollum (FR 1.ii.59), but will presently have an equally important change of heart (TT 4.i.615). The choice of language in both cases reflects the tension of the moment in each narrative (note also the use of 'thing' to describe Gollum in both texts): Bilbo facing a horrific choice; Frodo about to face the same choice. My other observation may be made more briefly. In Bram Stoker's Dracula Jonathan Harker several times witnesses the Count crawling headfirst down the wall of his castle (Chapter III, diary entries for 12 and 15 May; Chapter IV, diary entry for 29 June). The two descriptions do not resemble each other in any particular other than that they describe the same action, so I would suggest that any influence would be limited to the suggestion of the idea. Stoker's book was quite well thought of in Tolkien's youth, and very popular from the 1920s onward. So it is possible he knew it. The scene is also quite creepily memorable. I read it when I was 10 years old and never forgot it, despite the fact that I didn't read it again for over 40 years. Gollum looked at them. A strange expression passed over his lean hungry face. The gleam faded from his eyes, and they went dim and grey, old and tired. A spasm of pain seemed to twist him and he turned away, peering back up towards the pass, shaking his head as if engaged in some interior debate. Then he came back, and slowly putting out a trembling hand, very cautiously he touched Frodo’s knee – but almost the touch was a caress. For a fleeting moment, could one of the sleepers have seen him, they would have thought that they beheld an old weary hobbit, shrunken by the years that had carried him far beyond his time, beyond friends and kin, and the fields and streams of youth, an old starved pitiable thing. But at that touch Frodo stirred and cried out softly in his sleep, and immediately Sam was wide awake. The first thing he saw was Gollum ‘pawing at master,’ as he thought. Gollum withdrew himself, and a green light flickered under his heavy lids. Almost spiderlike he looked now, crouched back on his bent limbs, with his protruding eyes. The fleeting moment had passed, beyond recall. Now Sam’s reaction to waking up to find Gollum beside a sleeping Frodo is completely intelligible because this is not the first time he has done so. On that occasion, during the Sméagol-Gollum dialogue, the ‘pawing at Master’ soon threatened to become something else entirely: “Finally both [his] arms, with long fingers flexed and twitching, clawed towards [Frodo’s] neck.” (TT 4.ii.634) Moved by sudden fear, Sam is sharp and hasty. So in a heartbreaking instant, clear to us all, he fails the test of Pity. And in turn Gollum, stung by Sam’s gruff accusations, “withdrew himself.” Now in the present context, with two Gollums momentarily visible to us, this is a very interesting choice of words. For in Tolkien’s usage they suggest much more than a physical withdrawal. There is only one other sentence in all The Lord of the Rings where Tolkien uses the verb “withdraw” reflexively, and in that instance the sense is clearly not just physical. It is Gandalf, speaking of how perilous it would be for him to look into the palantír, who says: “even if I found the power to withdraw myself, it would have been disastrous for [Sauron] to see me….” (TT 3.xi.595). So, given the vision we have just been granted of the “old weary hobbit” reaching out to caress Frodo, “himself” may well also refer to this remnant of what Gollum had once been, to Sméagol perhaps, now gone beyond recall or redemption. And even as he draws back, the Gollum who was “almost … caress[ing]” Frodo at once becomes “almost spiderlike.” He reverts into the “nasty crawling spider on a wall” that the hobbits had first seen in the Emyn Muil, and foreshadows the real monster whom the reader does not even know is there yet. In a Tale which tells us right at the start that there is “not much hope that Gollum can be cured before he dies” and that “the pity of Bilbo may rule the fate of many” (FR 1.ii.59), Sam’s pitilessness is striking and poignant. For until now the reader has had small reason to pity Gollum, and little hint that somewhere within him there languished “an old weary hobbit” for whom we should feel pity as Bilbo did rather than loathing as Sam does. And yet, in that “fleeting moment,” as our beloved Sam blunders, our hearts come to know a pity that Sam’s has not yet learned. Before we consider this moment further, let us examine the portrayal of Gollum thus far. From the first even Gandalf, who learned pity at the feet of Nienna herself, has named Gollum a liar, a murderer, and a robber of cradles. He has confirmed Frodo’s disgusted assertion that Gollum deserves death. Aragorn in his turn was “not gentle” when he marched him from the Dead Marshes to Northern Mirkwood “with a halter on his neck, gagged, until he was tamed by lack of drink and food.” And the Wood Elves, to whom Aragorn had entrusted Gollum, receive only treachery and death for their kindness (FR 2.ii.255-56). When we first encounter Gollum in The Fellowship of the Ring, he is an elusive presence we can never quite get a look at. In the long dark of Moria his footfalls are an echo of menace and his glowing eyes bring unquiet dreams; in Lorien he appears in the wake of the orcs, a shadow sniffing about for his prey just as the Black Rider in the Shire had done; on the Great River he comes closer yet, still shadowy and still sniffing, and both Sam and Strider make clear that “murder by night” would be no surprise from Gollum. When the company is shot at from the eastern bank by orcs, Sam assumes that Gollum’s behind it (FR 2.ix.386). All of this sets the stage for our first clear look at Gollum in The Taming of Sméagol. There we first see him coming down a sheer cliff face “like a nasty crawling spider on a wall” (TT 4.i.612). There we first hear him venting his murderous hatred for “the thieves, the thieves, the filthy little thieves” who stole his Precious (4.i.613). But, with Sting at his throat, Gollum instantly becomes a groveling, lugubrious, wretch, sadly wronged by the “nice little hobbitses” to whom he of course meant no harm (4.i.614-615). Neither Frodo nor Sam are fooled by this transformation, but to Sam’s staring, scowling amazement Frodo pities Gollum and shows him mercy (4.i.615). And if we are not already as alarmed by this as Sam is, we need only see the flicker of “cunning and eagerness” in Gollum’s eyes as he agrees to help them (4.i.615). His immediate attempt to escape, followed by more fawning wretchedness, only strengthens the impression that Frodo’s pity is dangerous. Even the final words of the chapter, as they set out with Gollum as their guide, do not augur well: “Over all the leagues of waste before the gates of Mordor there was a black silence.” (4.i.619) Sméagol may have been tamed, but Gollum has not. If the One goes into the Fire, and we are at hand? I ask you, Sam, are we ever likely to need bread again? If we can nurse our limbs to bring us to Mount Doom, that is all we can do. More than I can, I begin to feel. Now earlier that very day, before the hobbits slept, Frodo had offered Gollum a share of their waybread. Though famished, he had rejected it with disgust “and a hint of his old malice” (4.ii.622). You try to choke poor Sméagol. Dust and ashes, he can’t eat that. He must starve. But Sméagol doesn’t mind. Nice hobbits! Sméagol has promised. He will starve. He can’t eat hobbits’ food. He will starve. Poor thin Sméagol. His fingers and face were soiled with black mud. He was still chewing and slavering. What he was chewing, they did not ask or like to think. Gollum needles the hobbits for their fear of him. He licks his lips, and makes clear that he had been watching them while they slept so beautifully. He then asks and answers his own question, quite smugly in fact – as if not murdering them in their sleep were an unanswerable proof of his good will. But he has misjudged the hobbits. They make no reply. In fact Sam’s answer was given before he was asked, in that cold shiver of loathing and disgust. Thus, a scene that begins with Sam feeling half remorseful ends with the repulsiveness and menace of Gollum confirmed. Once again our pity is elsewhere. Each time that the second thought spoke, Gollum’s long hand crept out slowly, pawing towards Frodo, and then was drawn back with a jerk as Sméagol spoke again. Finally both arms, with long fingers flexed and twitching, clawed towards his neck. On this showing we can hardly be surprised at Sam’s reaction when he awakens later on the Stairs to find Gollum ‘pawing at master,’ words which the narrator himself puts into quotes, to emphasize that Sam habitually thought this way. We can also see where the narrator stands. This is the only scene in The Lord of the Rings where the narrator in his own voice calls Gollum Sméagol, and he does so only to distinguish the one ‘thought’ clearly from the other. Elsewhere he is always just Gollum. For a fleeting moment, could one of the sleepers have seen him, they would have thought that they beheld an old weary hobbit, shrunken by the years that had carried him far beyond his time, beyond friends and kin, and the fields and streams of youth, an old starved pitiable thing. With these words the narrator steps out of the narrative to comment upon the scene, but amid the pathos evoked by this comment it is all too easy to overlook a very important point. With these words the narrator – Frodo, as we must recall, who is not omniscient – also steps beyond what he could have known. In that fleeting moment when Sméagol the old weary hobbit appears, Frodo and Sam, the only possible witnesses, are both asleep. So where does this vision come from? There was a little corner of [Gollum’s] mind that was still his own, and light came through it, as through a chink in the dark: a light out of the past. It was actually pleasant, I think, to hear a kindly voice again, bringing up memories of wind, and trees, and sun on the grass, and such forgotten things. The conversation between them grows more heated as Frodo’s fear mounts, until finally he rejects even the pity that Bilbo showed in not murdering Gollum, pity that Gandalf says was Bilbo’s salvation as well. Frodo feels no such pity. “You have not seen him,” Gandalf replies. “No, and I don’t want to,” is Frodo’s tart answer (FR 1.ii.59). And it is precisely this conversation that Frodo remembers when Gollum is at his mercy in the Emyn Muil: “I will not touch the creature. For now that I see him, I do pity him” (TT 4.i.615). Here, in another fleeting moment, we behold another vision of an old weary hobbit. What Bilbo saw beneath the Misty Mountains, we see as in a mirror on the Stairs of Cirith Ungol. In The Hobbit Bilbo, poised to commit murder out of fear, glimpses the hobbit that Gollum was, and turns to pity. In The Two Towers Gollum, also poised for murder, sees in Frodo what he himself has lost to the Ring – and what Frodo will lose before the end – and nearly repents. But he stumbles against the pitilessness of fearful, watchful Sam, and “withdraws himself.” As Bilbo leaped forward, Gollum fell back. The similarity in these two passages is of course no accident. For, as we learn from John Rateliff, Tolkien wrote them both at about the same time in 1944. And if this were any other author we might end now with a comment on how cleverly Tolkien uses the one passage to illuminate the other, and how the both of them work together to reveal the razor’s edge between murder and repentance, between pity and pitilessness, between leap of hope and lapse into despair. This post was first presented at the Third Annual Mythmoot in Baltimore, Md, on 1/10/2015. It took its first beginnings from our class discussions in The Two Towers course at Mythgard Institute in the summer of 2013. Some months later I sent Corey Olsen an email running the idea in this paper by him. He was very encouraging and suggested I submit it for presentation at the next Mythmoot. The more I thought my way through this idea, the more ideas came to me, too many to be included in 15 to 20 minutes. Most of these involved analyses that I believe supported the point I was attempting to make in this paper. They became footnotes. But it was also clear to me that at least some of these observations were interesting in their own right and deserved more attention. Anyone who has read the Tolkien posts on my blog (assuming anyone reads my blog at all) will recognize the seeds of these posts in the footnotes to this paper. Wherever one of those ideas has led to a post, I have included the link at the end of the footnote. I am still mining the material, and more will be added. I can only hope that this vein leads to mithril, and not a balrog. My thanks to all at Mythgard and Mythmoot for the kindness and courtesy with which they heard me out. The Letters of J.R.R. Tolkien, selected and edited by Humphrey Carpenter (Boston, 1981), letter 246, p 330. Cf. also letter 165, p. 221, quoted below n. 31. All citations of The Lord of the Rings are from the one volume 50th anniversary edition (New York, 2004). For Tolkien’s assessment of Sam’s failure here, see Letters (1981) letter 246, p. 329-330. A search reveals twenty two instances of the verb “withdraw” in The Lord of the Rings. Twelve times the verb is intransitive, nine times transitive (including these two passages), once a gerund. In all the other transitive uses of the verb the object is something like “gaze,” “forces,” etc. Whenever Tolkien means to indicate merely physical removal or retreat – as in, e.g., “the further you go, the less easy it will be to withdraw,” (FR 2.iii.281) or “Strider withdrew into a dark corner,” (FR 1.x.166) – he simply uses the intransitive, which again suggests that the reflexive use of the transitive is not equivalent to the intransitive use. The two are not synonymous. The noun “withdrawal” does not occur. Even if we allow that a physical withdrawal is part of what Gandalf refers to, more important and difficult would be the mental or spiritual withdrawal. Compare the experience of Pippin, who “gave a gasp and struggled” when the light within the palantír went out. Then, the moment he regains consciousness, “he struggled to get up and escape” (TT 3.xi.592-93) . And when Pippin recounts his own experience with Sauron he says “I struggled. But [Sauron] said ‘Wait a moment! We shall meet again soon.’” (TT 3.xi.593). Cf., too, Aragorn’s contest with Sauron for mastery of the palantír, which he twice calls a struggle (RK 5.iii.780). Clearly the heart of the struggle here is not physical. Thus, neither is the withdrawal. TT 4.i.612. Gollum is twice more likened to a spider (TT 4.i.614, iii.645), and once to “some large prowling thing of insect-kind” (TT 4.i.615). Since Tolkien originally described Gollum as coming down the wall “like a fly” (The History of Middle Earth, VII.329 n. 15, italics his), and retroactively inserted the references to Shelob into the Sméagol/Gollum dialogue (HME VIII.115), it may be that the spider comparisons were also inserted as the solitary Shelob replaced what had been a Mirkwood-like horde. In general see HME VIII.187-191. The one sure hint, however, is long ago at FR I.ii.55. Gollum’s youthful interest in tales parallels Sam’s own, and Sam takes note of it (TT 4.iii.641, 646-647). It sparks perhaps the kindest impulse Sam ever has towards him (TT 4.viii.713), but it does not suggest their kinship as hobbits. Neither is typical: Sam view stories as more than childhood entertainments; and Gollum is a murderer (cf. Frodo’s words at RK 6.viii.1006). Sam will learn pity once he has borne the Ring (RK 6.iii.944), but “for the good of Gollum too late” (Letters, 246, p. 330). “Wisest of the Maiar was Olórin. He too dwelt in Lórien, but his ways often took him to the house of Nienna, and of her he learned pity and patience” (The Silmarillion 30-31). As pity is Gandalf’s greatest strength, so it is his greatest weakness: “Yet the way of the Ring to my heart is by pity, pity for weakness and the desire of strength to do good…. The wish to wield it would be too great for my strength” (FR 1.ii.61). “The Woodmen [of Mirkwood] said that there was some new terror abroad, a ghost that drank blood. It climbed trees to find nests; it crept into holes to find the young; it slipped through windows to find cradles” (FR 1.ii.58). Gollum’s cannibalism, already established in Riddles in the Dark, is a trait he shares with orcs: TT 3.iii.446 (man- and orc-flesh), and 450 (Pippin’s refusal to eat meat provided by the orcs); 4.iv.651 (the bones in Ithilien). Sam initially thought “the desire to eat hobbits” was the chief danger Gollum posed (TT 4.ii.634). Though Gandalf of course does not think that such a sentence should be carried out: FR 1.ii.59. FR 2.ii.253. In The Hunt for the Ring we are given a detailed description of the route they took, and told that, “according to Aragorn,” this journey lasted from 1 February to 21 March, close to 900 miles on foot in 50 days (Unfinished Tales, Boston 1980, p. 343). Not gentle indeed. In Moria: FR 2.iv.312, 318. In Lorien: FR 2.vi.345; Black Rider: 1.iii.75-76, iv.86, xi.189; cf. 1.v.108. On the Anduin: FR 2.ix.382-84. That Gollum will murder them in their sleep is a frequent – and not unjustified – concern of Sam’s. He warns Frodo about precisely that before they fall asleep on the stairs of Cirith Ungol: “If we’re caught napping, Stinker will come out on top pretty quick” (TT 4.viii.714). See also 4.i.617; ii.621, 622-24, 633-35. Not unreasonably so. Grishnákh for one knows who Gollum is (TT 3.iii.455-56). When Sam objects that Gollum’s plan is no doubt to “throttle us in our sleep,” Frodo agrees, but denies that Gollum’s plans for them should have a bearing on theirs for him (TT 4.i.615). Expecting mischief, they then pretend to sleep, and subdue him again when he attempts escape (4.i.616-619). Frodo’s pity and mercy, and Sam’s reaction to them, mark the emergence of the difference of opinion between Frodo and Sam about Gollum. Sam soon recognizes that Frodo and Gollum can communicate with each other in a way he doesn’t understand. Indeed the three of them are on proximate roads which meet up on the slopes of Mt Doom, when Sam, now a ringbearer too, can understand, and feel the pity Frodo feels here. The title of this chapter, The Taming of Sméagol, is positively tricksy in view of the narrator’s use of “Sméagol.” See below n. 26, and my post "The Naming of Sméagol." But even this realization is tempered and cautious: “then it also occurred to him that his master had been right: there had for the present been nothing to guard against” (TT 4.ii.623, italics added). Just the day before Sam and Frodo had discussed their fears, but made no effort to conceal them. Sam “did not really care whether Gollum heard him or not” (TT 4.ii.622), and Frodo had answered “speaking openly” (4.ii.623). Later at TT 4.iii.640-641 Frodo speaks of trusting Gollum, but adds that he has had little choice. While unaware of Gollum’s conversation with himself (TT 2.ii.632-34), Frodo is not blind: he reduces Gollum to cowering terror by threatening him with the Ring. “Gollum was talking to himself. Sméagol was holding a debate with some other thought that used the same voice but made it squeak and hiss. A green light and a pale light alternated in his eyes as he spoke” (TT 2.ii.632). Thus we see differences in speech, eyes, action, and thought, both in the sense of intent, and of mind or what we might today be more inclined to call “personality.” This use of the word "thought" seems unprecedented in Modern English. Tolkien had to dig deep for it. It was used in the Lindisfarne Gospels over a millenium ago. 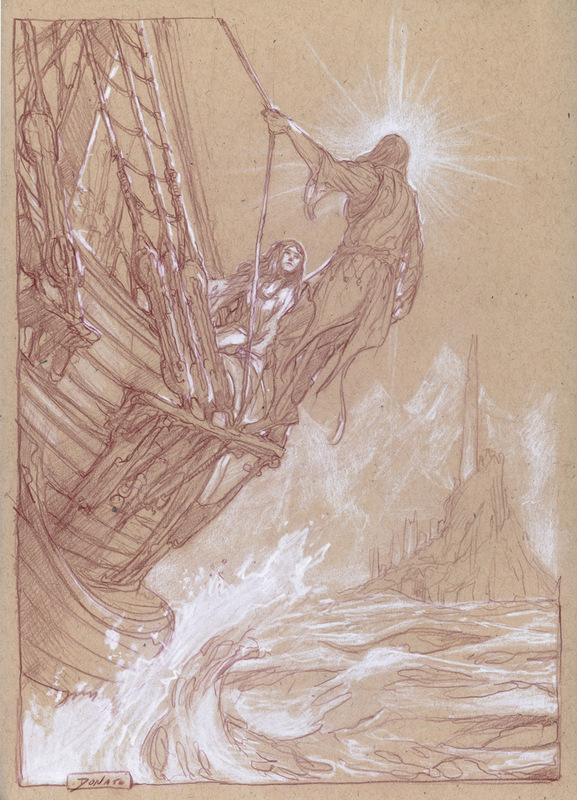 See my post "The Naming of Sméagol," note 3. “Pawing:” TT 4.i.618; ii.633, 634; iii.637; iv.651; viii.714. Only two other characters are so described, Grishnákh (3.iii.455; ix.564), and Sam, of all people, when Frodo, fearing for the Ring, sees him as an orc (RK 6.i.912) Sam of course had had Gollum’s fingers at his own throat within seconds of meeting him (TT 4.i.614). See also Gollum’s catchy endorsement of fish (“Makes eyes bright, fingers tight,” TT 4.vi.686; cf. 688). Already, years before, Gollum had beheld her, Sméagol who pried into all dark holes, and in past days he had bowed and worshipped her, and the darkness of her evil will walked through all the ways of his weariness beside him, cutting him off from light and from regret. “Sméagol” is here in apposition to “Gollum,” and as such is syntactically and logically subordinate, a supplemental description of the main subject. Sméagol’s characteristic of prying into dark holes both explains his acquaintance with her and recalls Gandalf’s initial description of him as unduly interested in things that were secret and hidden (FR 1.ii.53). The sentence is very interesting otherwise. In The Lord of the Rings only Sauron is said to have been worshiped by anyone (RK 5.ii.782, x.888), and as Galadriel entertains the idea of what would happen if she had the Ring, she appears “worshipful” to Frodo (FR 2.vii.366). There is what seems to me a bleak echo of the sixth verse of the twenty-third Psalm in “and the darkness…beside him.” Lastly, the sundering of Gollum from regret makes clear the difficulty of repentance. In FR only Gandalf and Legolas use "Sméagol" in The Return of the King only Gollum. Appendix B reveals an interesting progression: he is Sméagol when he kills Déagol (RK B.1087), Sméagol-Gollum while under the Misty Mountains (1089), and Gollum once he leaves (1089). It may be coincidence, but the transition from Sméagol-Gollum to simply Gollum matches up pretty closely with Gollum’s statement at TT 4.i.616: “Don’t ask Sméagol. Poor, poor Sméagol, he went away long ago. They took his Precious, and he’s lost now.” “They” of course can only refer to Bilbo. For an extended analysis of the use of "Sméagol," see my post "The Naming of Sméagol." By recalling Frodo’s conversation with Gandalf from The Shadow of the Past the narrator underlines the moral correctness of Frodo’s pity and mercy. Note the echo of the words “….while he had any strength left….He must stab the foul thing” in Frodo’s statement to Gandalf: “What a pity Bilbo did not stab that vile creature when he had the chance” (FR 1.ii.59). Bilbo of course need not have recognized Gollum as a hobbit per se then or later, but he had to come to see him as a person, not a “foul thing.” The sentence “And he was miserable, alone, lost” signals this transition. Gollum is now “he,” not “it,” which produces an intriguing moment of ambiguity. Every other “he” in this paragraph refers to Bilbo. And that ambiguity allows recognition, pity, horror. Aristotle would have been pleased. “Bilbo’s sudden insight into Gollum’s inner life here is on par with the unwitnessed moment outside Shelob’s lair when Gollum briefly appears as ‘an old weary hobbit […’] – not surprisingly because both passages were written at about the same time.” John Rateliff, The History of the Hobbit, revised and expanded one-volume edition (London, 2011) p. 745 n 38. Rateliff also cites HME VIII.183-84, where Christopher Tolkien establishes the date of this chapter of The Lord of the Rings as May 1944 on the basis of his father’s letters. For the dating of these revisions to The Hobbit see Rateliff pp. xxvii, and 731-32. When he was 99 (TA 2989), Bilbo adopted Frodo as his heir, and brought him to live at Bag End (FR 1.i.21). Soon thereafter he told him the true story, which Gandalf already knew (FR 1.i.40). “But many copies [of the Red Book] contain the true account (as an alternative), derived no doubt from notes by Frodo or Samwise, both of whom learned the truth, though they seem to have been unwilling to delete anything actually written by the old hobbit himself” (FR pr. 13). The book Frodo hands Sam in The Grey Havens has this periphrasis below the title: “…being the memoirs of Bilbo and Frodo of the Shire, supplemented by the accounts of their friends and the learning of the Wise” (RK 6.ix.1027. We can see this process at work, for example, in Pippin’s recollection of Treebeard’s eyes (TT 3.iv.463), and in the tale telling in the evening after the Field of Cormallen (RK 6.iv.955-56). The passage in The Grey Havens where Frodo sees “a far green country under a swift sunrise” offers an intriguing parallel (RK 6.ix.1030). Sam must be the author here, but he cannot have witnessed this scene. The text specifically mentions Frodo’s dream “in the house of Bombadil” (FR 1.viii.135), which this scene realizes. Sam, therefore, must have known of this dream because Frodo had told him, or because he had read it in the book. But this scene is all Sam, and fits his character as described from the beginning: “They are sailing, sailing, sailing over the Sea, they are going into the West and leaving us.” (FR 1.ii.45). He uses the dream to give Frodo the happy ending he feels he was denied (RK 6.ix.1029). Not of course that any reader should doubt that this is what actually happened. See also my "Happy Endings, by S, Gamgee,"
For so important a character, Gollum arrives rather late on the scene, first appearing on page 612 of 1,031 in the single volume 50th anniversary edition. That's well beyond halfway through (59.35%). By 'first appearance' I do not suggest, clearly, that Gollum's significance before now has also been slight, or that his presence has not been felt. Quite the contrary. He was brought up in a critical connection in A Long-expected Party (FR 1.i.33-34), discussed at great length in The Shadow of the Past (FR 1.ii.52-60), and spoken of again in The Council of Elrond (FR 2.ii.249, 251, 253-56). Ever since Moria he has been stalking the Company (FR 2.iv.312, 318; vi.345; ix.382-86; x.395, 402). For all that, the closest anyone, the reader included, has come to catching more than a glimpse of him so far is when Frodo, with sword drawn, confronts a shadow on the dark banks of the Anduin (FR 2.ix.383-84). From that point onward he vanishes from the narrative (with one important exception: TT 3.iii.455-56) for over two hundred pages, until Frodo and Sam mention him (TT 4.i.604-05) on the morning of the day on which they spy him crawling down the the cliff face. Before we examine the earlier passages to see what they reveal about the portrayal of Gollum prior to his arrival 'on stage' in The Taming of Sméagol, let me address a couple of points a sensitive reader might raise. Since Gollum was introduced in The Hobbit, why not start there? There are several answers to this, I think, First, the portrayal of Gollum in The Lord of the Rings must stand or fall on its own merits regardless of how well or ill it matches what is found in The Hobbit. Second, Tolkien rewrote the portrayal of Gollum in The Hobbit to suit the portrayal in The Lord of the Rings in 1944, precisely when he was writing Book Four of The Lord of the Rings in which Gollum plays so large a role, beginning with his entry in the scene quoted above.1 As a result, it may reasonably be argued, the later work became the primary text on Gollum, supplemented and crucially supported by the earlier in theme and character. It is also true and relevant, moreover, that not everyone reads The Hobbit first. I did not. In fact I believe I read The Lord of the Rings several times before I turned to the earlier work, and found myself put off for quite a long time by its very different tone. Consequently I deprived myself of opportunities for deeper insight. In view of all this, I will discuss the material in The Hobbit, but only after examining Bilbo and Frodo's conversations with Gandalf about Gollum in the first two chapters of The Fellowship of the Ring. What about the assertion that Gollum disappears for more than two hundred pages? Someone might reasonably object that, while it's accurate as far as pages are concerned, it's misleading in terms of narrative time. Within the story Gollum is referred to by Aragorn on the day the fellowship was broken, 26 February, and meets Frodo and Sam in The Taming of Sméagol three days later, on 29 February (FR 2.x.402; RK 1092). True enough. But it is also true that the reader does not experience their story in this way. We do not cross the river straightaway with Frodo and Sam. No, we follow the other members of the Company for ten eventful days, which, to be brief, include '[o]rcs, and talking trees, and leagues of grass, and galloping riders, and glittering caves...and golden halls, and battles' (RK 6.iv.955).2 Starting with the heroic death of the redeemed Boromir and ending with the defeat of the traitor Saruman, Book Three contains enough of pity and fear, courage and wonder, to stand as an epic all on its own. So even when we return to Frodo and Sam in Book Four, a mere three days after their last appearance in The Breaking of the Fellowship, it does not feel like so brief a time has passed.3 Chronologically, the objection is a point well made, but in terms of narrative it neglects the overwhelming impression made by the high and extended drama of Book Three. 'I'll do as I choose and go as I please,' said Bilbo obstinately. 'Well, if you want my ring yourself, say so!' cried Bilbo. 'But you won't get it. I won't give my Precious away, I tell you.' His hand strayed to the hilt of his small sword. Gandalf's eyes flashed. 'It will be my turn to get angry soon,' he said. 'If you say that again, I shall. Then you will see Gandalf the Grey uncloaked.' He took a step towards the hobbit, and he seemed to grow tall and menacing; his shadow filled the little room. Bilbo backed away to the wall, breathing hard, his hand clutching at his pocket. They stood for a while facing one another, and the air of the room tingled. Gandalf's eyes remained bent on the hobbit. Slowly his hands relaxed and he began to tremble. 'I have never called you one,' Gandalf answered. 'And I am not one either. I am not trying to rob you, but to help you. I wish you would trust me, as you used.' He turned away, and the shadow passed. He seemed to dwindle again to an old grey man, bent and troubled. Very well,' said Bilbo, 'it goes to Frodo with all the rest.' He drew a deep breath. 'And now I really must be starting, or somebody else will catch me. I have said good-bye, and I couldn't bear to do it all again.' He picked up his bag and moved to the door. After the lighthearted, humorous tone of the first dozen pages of the story, this scene is shockingly tense, moving from discomfort to anger to accusations to threats of violence. His face flushed and hard looking, his eyes alight with anger, his voice loud, his tone obstinate, one hand clutching the Ring, the other the hilt of his sword -- this is not the kindly and generous, clever and funny old hobbit we saw before -- when? Before Gandalf pressed him about the Ring, yes, but also before he used the Ring at the party. That Bilbo has disappeared, for now. Can this dark turn that Bilbo takes be unconnected to his use of the Ring only minutes earlier? That does not seem quite likely. And it is precisely Bilbo's behavior where the Ring is concerned that prompts Gandalf to make the comparison between Bilbo and Gollum to which Bilbo reacts so strongly. But his reaction is itself rather telling and disturbing, because Bilbo does not deny the applicability of the comparison, as we might expect him to do. Instead he denies its relevance. 'So what,' in essence, is this Bilbo's reply, which simultaneously accepts the accuracy of Gandalf's statement and seeks to dismiss its significance. None of this, however, escapes the wizard, whose manner now becomes stern and whose warnings now characterize Bilbo as a fool and a slave of the Ring if he is determined to keep it. When the hobbit responds by 'obstinately' asserting his freedom to choose and to act as he wishes, Gandalf stresses the obligations of their long friendship and demands that Bilbo keep the promise he had made to give it up. Again, as with the comparison to Gollum, Bilbo's response is not what the earlier scenes of this chapter, or even the earlier moments of this scene, might lead us to expect. From obstinacy Bilbo passes into a truculent paranoia, accusing his old friend and threatening him with his sword. Even after Gandalf daunts him into backing down,4 Bilbo still speaks at first as if he were the wronged party, full of the same attempts at justification as he was before. Yet saying that Gollum would have killed him if he had not kept the Ring is the hollowest excuse of all. For, however true it may be, it reduces his claim to the Ring to one of expediency, and he is making the claim to someone he has just threatened with a sword himself. The threat of murder he has just made vitiates the pretext he offers about the threat of murder he had felt then: both center on keeping the Ring. But Gandalf lets this pass with a soft answer, and Bilbo's wrath turns aside and fades. He returns to himself, not quite knowing what had come over him, but aware that the Ring had something to do with it. There's much we can see here about Bilbo, or, if one prefers to speak more cautiously, about the effect of the Ring on Bilbo. The use of the Ring, and indeed the mere possession of it (as Bilbo's remarks after his threat make clear), subvert the mind and the will. Even the fabulous birthday party and his soon to be legendary practical joke were made possible, and indeed necessary, by the Ring. As Bilbo himself says, they were his vain attempt to cozen himself into giving it away painlessly by giving away everything else along with it. As Bilbo's wrath runs off, his sense of humor returns, but what was so wry before has now become rueful. And the Ring remains in his pocket even after he again agrees to give it up. Another nudge from Gandalf, another twitch of reluctance, another flash of anger, and the Ring is finally delivered up. Then at last comes the laughter of heart's ease. It has been necessary to quote and discuss this passage at such length because of the struggle that Bilbo goes through to give up the Ring he got from Gollum. It is a struggle of the will, and of the body5, which undermines the good of his character and turns him, when pressed to keep his promise, into someone who, as Gandalf sees it, resembles Gollum. Bilbo thus serves as the reader's first introduction to Gollum in The Lord of the Rings. So if we are to believe Gandalf, which it seems we are since Bilbo doesn't dispute the accuracy of the comparison, what does this passage tell us of Gollum? Explicitly? That he called the Ring 'My Precious,' that he would have killed Bilbo if Bilbo had not already found the Ring, and that he called Bilbo a thief. Implicitly? The words that prompt Gandalf to see the likeness between Bilbo and Gollum -- 'It is mine, I tell you. My own. My Precious. Yes, my Precious.' -- reveal someone who dotes on the Ring with a most jealous gaze, an eye of vigilance and resentment, solicitude and suspicion. And even if Bilbo has become such a person only in and for this instant, it is still enough to tell us of Gollum, and to suggest why he might have wished to kill Bilbo and why he called him thief. As he will remain for most of The Lord of the Rings the Gollum we glimpse here is a shadow cast from offstage, a murderous, resentful ghost from the past, summoned into the present by Bilbo's words and deeds on the night of the party. He may also be seen as a harbinger of what Bilbo might permanently turn into if he does not let go of the Ring and become free. But we see him only through Bilbo (who is also the source of all Gandalf's current knowledge), and there is at this point no hint that he will ever enter this Tale. Nor would we want him to. We begin with a negative impression, however darkly reflected through Bilbo. Three more posts will follow on this subject. The next will cover what we learn of Gollum in The Shadow of the Past. Then I will turn to considering the material from The Hobbit and the Prologue. Finally I will consider the remaining references, from The Council of Elrond through to the end of The Fellowship, together with the one mention in Book 3. This should allow us to assess how we have been prepared for the actual arrival of Gollum in Book 4. 1 The dating of the composition of Book Four is most prominently attested by the author's own words in the Foreword to the Second Edition (FR xxiii). For the dating of these revisions to The Hobbit to this same period, see John Rateliff The History of the Hobbit, revised and expanded one-volume edition (London, 2011) xxvii and 731-32. Tolkien could have easily left The Hobbit as it was, and still represented the story Bilbo told at first as a lie. But he didn't, which bespeaks more than a donnish cleverness that he and the other Inklings would have laughed about at The Bird and the Baby. By rewriting the earlier work to match the later one he evinced a desire for intertextuality and indicated which work he considered the primary text. 2 Ten days: 26 February to 5 March (RK 1092). Keep in mind that in the Shire-reckoning February (like every other month) has 30 days, not 28, and the Tale of Years in Appendix B is presented as composed by hobbits (RK 1107; Cf. also FR 14 on the writing of the appendices). It was the third evening since they had fled from the Company, as far as they could tell: they had almost lost track of the hours during which they had climbed and laboured among the barren slopes and stones of the Emyn Muil, sometimes retracing their steps because they could find no way forward, sometimes discovering that they had wandered in a circle back to where they had been hours before. Not even Frodo and Sam are sure how long it has been since they left the others. It seems to me that time plays different roles in Books Three and Four. In Book Three the passage of time and the covering of distance are factors critical to the unfolding of events. We are constantly reminded of the importance of 'how long' and 'how far.' In Book Four the journey they are on is not to be measured in days and leagues. I hope to examine this question elsewhere. There is a passage in Patrick O'Brian in which he describes what time is like in a ship long at sea out of the sight of land. The rising and the setting of the sun, the ship's bells, the ceremony of noon, the changing of the watches, all the indicators commonly used to keep track of time cease to measure the passage of time and begin only to mark the orderly succession of the days. I wish that I could find O'Brian's more precise and elegant formulation of this phenomenon, which I believe aptly describes role of time in Book Four. 4 What exactly does Gandalf do here? Is it mere physical intimidation and moral authority, or is it something more? I believe there's a clue in 'Gandalf's eyes remained bent on the hobbit,' which is reminiscent of the moment in The Mirror of Galadriel when Galadriel holds each of the Company with her eyes and seemed to test each of them mind to mind (FR 2.vii.357). This clearly seems to be an example of what she later describes as using the will to dominate others (FR 2.vii.366). That, I believe, is what Gandalf is doing here, not in order to compel Bilbo to give up the Ring (cf. his comments at FR 1.ii.60, where he denies that he could make Frodo give up the Ring 'except by force, which would break your mind'), but to compel him to back down from the savage pitch he has reached. 5 Bilbo's jerking his hand back as he tries to set the Ring and envelope down is soon echoed by Frodo's attempt to throw the Ring into the hearth at Bag End in the next chapter, only to find that he had put it back in his pocket after all (FR 1.ii.60). For the end of this road, see RK 6.iii.935, 942-43. Note how Frodo makes no attempt not to clasp the Ring when Gollum attacks them on the slopes of Mt Doom only moments after he has begged Sam to help him keep his hand off it (RK 6.iii.943-44). Next of course he puts it on and claims it for his own -- 'The Ring is mine' (RK 6.iii.945). Related to this may be the perception that the weight of the Ring increases as Frodo draws closer to Mordor. But this is another interesting study for another day.